Bernard Dudot was educated at the Center d'Etudes Superieures de Techniques Industrielles in Nancy. A fan of racing, he joined the Alpine company in Dieppe in 1967 and began working on the design of a Formula 3 engine, which was financed by Elf. This low-key program was the start of Renault's sporting involvement which would lead to Formula 1 nine years later. After success in Formula 3 with drivers Patrick Depailler and Jean-Pierre Jabouille, Dudot moved to Renault-Gordini at Viry-Chatillon in 1973. A year later the whole of Alpine was merged into Renault-Gordini but by then Dudot was in the United States studying turbocharging. While he was doing this Francois Castaing and Jean-Pierre Boudy designed a two-liter V6 engine for Formula 2 and sportscar racing, which enjoyed great success in the mid-1970s. During 1975 Dudot worked on a turbocharged version of this engine for the Le Mans 24 Hours and also on the 1.5-liter turbocharged engine which Renault was planning to use in F1. This remained a secret until early in 1976 when the prototype Renault F1 car - codenamed the Alpine A500 - ran at the Michelin test track at Ladoux, near Clermont-Ferrand. It would be a year before Renault admitted that it was planning a F1 project but within a couple of months of the announcement Renault Sport entered its first Grand Prix, the British GP of 1977. Two year later Jabouille scored the first of many F1 victories for Renault in the French GP at Dijon-Prenois and for the next seven years Renault was a major force in F1, but failed to win a World Championship despite the best efforts of Jabouille, Rene Arnoux, Alain Prost and others. 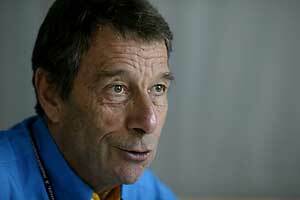 In 1980 Dudot became technical director of Renault Sport when Francois Castaing was promoted out of F1. Dudot remained at Viry-Chatillon after Renault pulled out of Grand Prix racing at the end of 1986 and in March the following year, with a handful of engineers, began studies for a normally-aspirated V10 engine. Fifteen months later Renault concluded a three-year deal with Williams for the 1989-90-91 seasons. Renault had to be patient but in 1992 Nigel Mansell finally managed to win the company its first World Championship and after that the Renault V10 engine became the dominant force in F1, winning five Constructors' titles and four Drivers' titles. At the end of the 1997 season Renault handed over its equipment to Mecachrome and pulled out of F1. Dudot was offered the role of technical director of Prost Grand Prix. He was replaced in June 1999 by Alan Jenkins. Dudot later popped up again working on the Infiniti engine programme in the Indy Racing League. After that program ended Dudot had a brief spell with Menard Cheever Technologies in 2003 before returning to France to be the manager of Renault Sport.